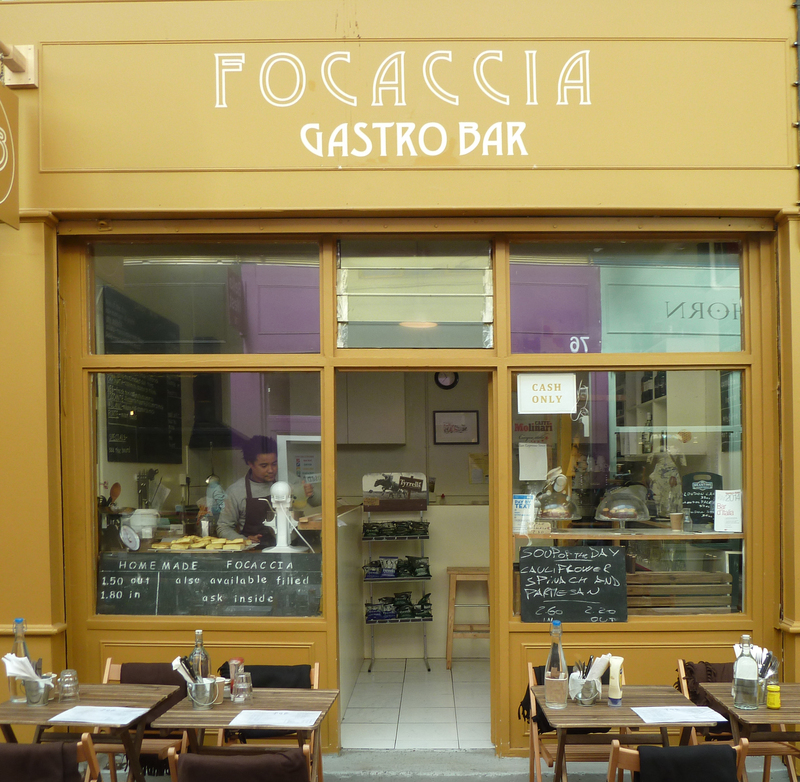 Focaccia GB is a newish addition to Brixton Village although we have eaten there a couple of times before. However, this was after trips to Snugg (more later) and Champagne and Fromage, so we decided on this occasion to approach it when sober. This is a small restaurant with no space to eat inside but with tables out front. Because it is near to Snugg it can get quite loud at the end of the week with the live DJ but on this occasion it was early on a Thursday so it was quiet and there was plenty of room. During the day Focaccia GB sells filled fresh baked focaccia and ciabatta with the bread being baked each morning. Fillings include prosciutto, tomatoes, mozzarella and salami as well as caponetta. In the evening they serve assaggini which are small plates and are presumably the same as cicchetti, which are from Venice. 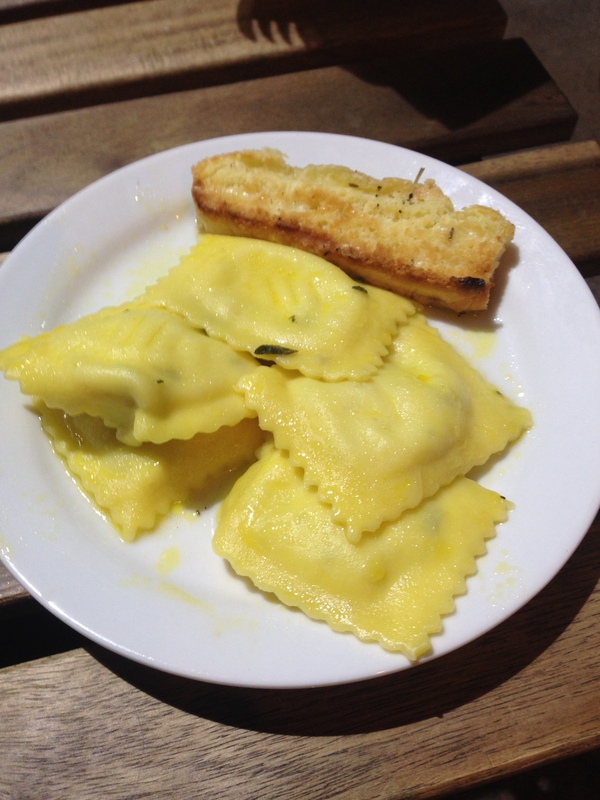 These are small tapas like dishes such as pasta –two types on the night we went – ravioli funghi porcini (ravioli stuffed with mushroom with butter and sage) and quadrotti ricotta spinaci (like ravioli but stuffed with ricotta and spinach with a tomato and parmesan sauce). The menu also included meatballs (beef and pork with tomato sauce) and cod with spinach and walnuts. There are also some specials on a blackboard but we now can’t remember what they are. However, there is enough to choose from and a blessedly short menu is what we like, as we don’t get overwhelmed or suffer from regret for not trying something later. They also have a dessert but you have to ask what that is each day. We chose the two types of pasta and started with the Antipasto Italiano to share. 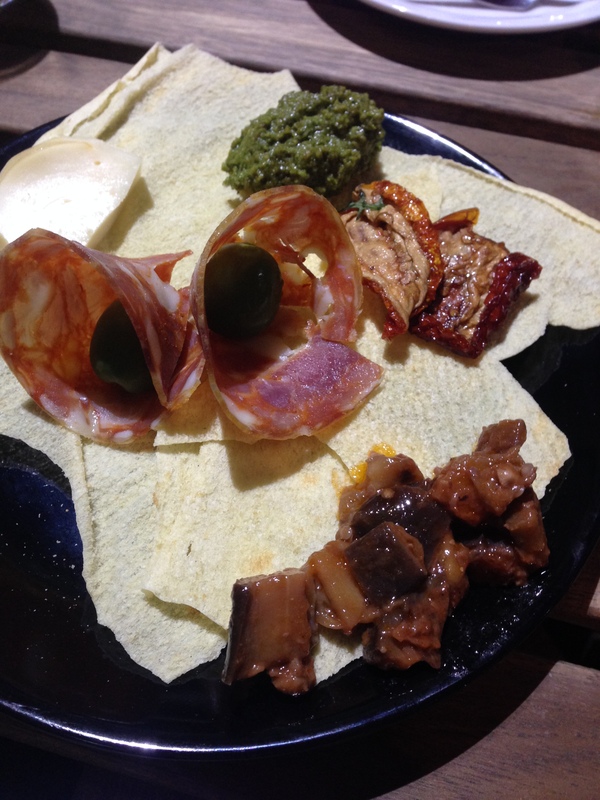 The antipasto consisted of salami (quite peppery wrapped around a Puglia olive), sundried tomatoes, thick pesto, cheese (we don’t remember which one) and the most delicious aubergine which we would have eaten as a main course. All the antipasto sat on crisp bread which allowed you to scoop it up, although we had to resort to the fork a couple of times. 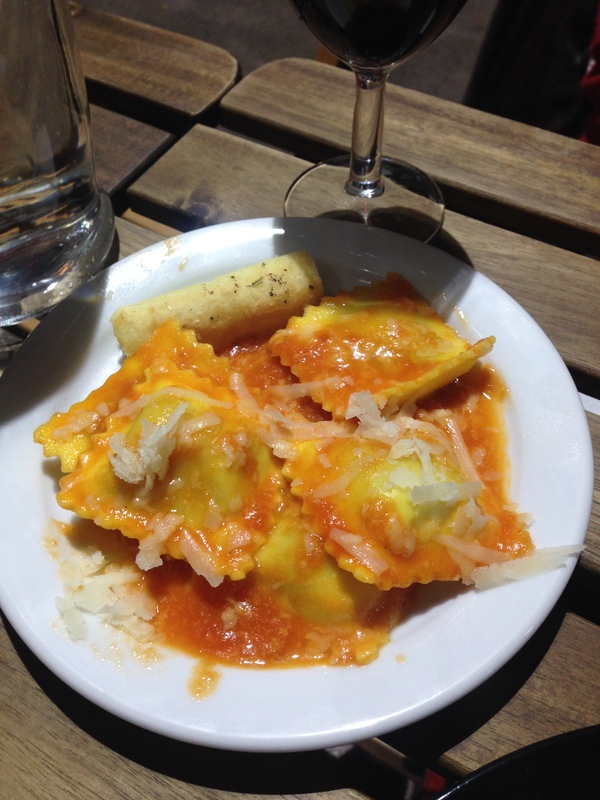 Both kinds of ravioli were soft and slid down easily and both came with a soft bread stick to wipe up the sauce. We preferred the little parcels of ricotta and spinach and our only criticism is that we would have liked more porcini in the ravioli. We washed these small plates down with small glasses red wine – one from Montepulciana and one Pugliese – both of which were good. The staff are enthusiastic and willing to explain all the dishes so you feel you really are making the right choice. They did explain that we needed more dishes than three for a whole meal but we were not really very hungry, so stuck to three and shared each one. The bill came to £21.60 – we will definitely be going back to try the other dishes.